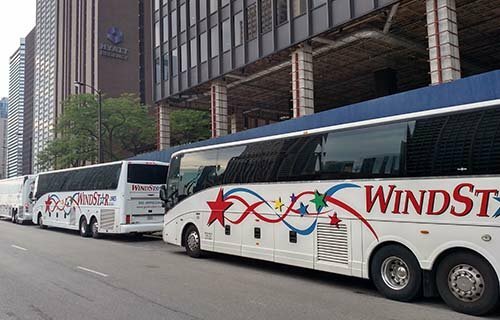 Windstar Lines offers shuttle bus rentals at locations all over the country. We have trained, licensed drivers who would be happy to accommodate your needs, whatever they may be. Our large fleet of buses and motorcoaches ensure that your group will be shuttled safely and comfortably. We have arranged service for over 100 motorcoaches for large-scale transportation events, so no group is too large for us. Let us take the stress out of coordinating your travel. Our standard and optional amenities include plush, spacious seating, WiFi, 110V outlets, DVD players, light-filtering window coverings, satellite programming, flat-screen TVs, and state-of-the-art climate control systems.